Another year, another list! What could be more exciting than the thought of future travels? Get another taste of our 7,107 islands through these picturesque gems! No budget for Batanes quite yet? This little piece of heaven offers just as cinematic a sight, without the bank-breaking price. Worthy of a postcard with its lush greenery and alluring cliffs, Binurong Point is definitely one of Catanduanes’ best kept secrets. A five-hour boat ride has never been more worth it. 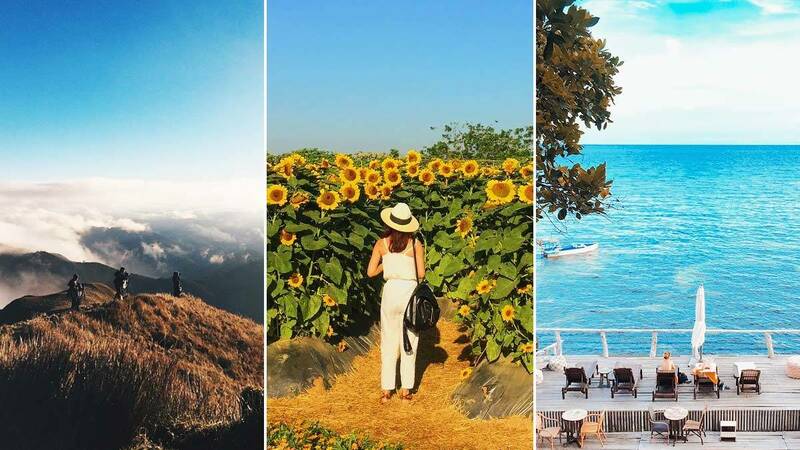 This island has a little bit of everything—from fields of green to waves of blue, from Little Batanes to Little Boracay. Move over white sand, gold sand is our new beach aesthetic. Walking through these yellow gardens will surely give you all the Tumblr feels. Revel in flower power as you catch these beauties in full bloom! Note: The farm is only open during the first quarter of the year. Feeling adventurous but not an outdoorsy gal? Glamping, or glamorous camping, can help ease you in! Rough it out (but not too much) in this eco-luxe boutique campsite, complete with the most adorable Kombi van for a quick photo op! Take a dip in Rizal’s refreshing waters after a quick hike up nearby Mt. Daraitan, and find yourself instantly re-energized! The soft current and delicate rocks also make for a dreamy photo shoot backdrop. Doing it for the ‘gram? Well then you’re in for a treat, because Mt. Pinatubo is one of the easiest yet most rewarding treks you’ll ever take. The lahar formations are a wonder to look at, and you score serious badass points riding that 4x4, too. Gorgeous is an understatement for the view that greets you at the summit. The sunrise alone can make a morning person out of anyone! Just be sure to keep warm and toasty going up, because temperatures may drop to zero or lower on some days. When you’re all surf-ed out from the beaches, why not try catching a different wave? Take a shot at sand boarding down these beautiful mini-deserts, and be rewarded with an amazing sunset view on the way home. Oh honey, this is the bee’s knees! We can’t get enough of that smashing view. Enjoy it with equally amazing dessert by The Buzz Café, whose ice cream flavors are simply divine: Malunggay, Spicy Ginger, Durian, anyone? Santorini who? We’ve got our very own white paradise here! Bella Roca sits on a quiet island, perfect for a much-needed getaway from the city. Check out that showstopper of a mountain view and tell us we’re not #blessed.